QMS offers a range of land and underwater LED self-powered lighting with extra low voltage, 12VDC for military and civilian applications. 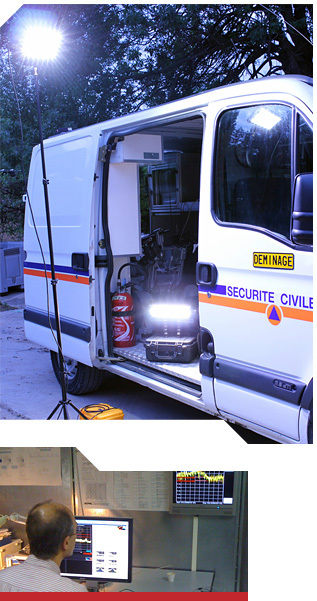 QMS lights can be adapted across all types of support for beaconing and lighting of large areas on land and underwater. Our products come in standard 2, 3, 4 or 5 element versions, wide or narrow beam, 5,000 or 3,600 Kelvins base colour temperatures, diffused opal white and red. Other sizes and colours are available upon request. Each land or underwater light is designed with the various armed forces according to their requirements. The equipment is designed and manufactured entirely in France with components originating from the EC and Switzerland. All tests are carried out at French laboratories. Our "Design" page gives a better understanding of the advantages of our products. On the "Partners" page, you can learn who our main suppliers of high quality electronic components are. From the Ministry of Defence, Clearance Divers to Civil Defence… the "References" page displays images of the various army services that use our products. Contact us today via our dedicated "Contact" section.